At the beach, in the park or just simply relaxing in your own back garden, this useful yet elegant picnic rug provides enough comfort for your whole family and all of your friends. Secure it to the ground with the four giant pins, slip your sunshade through the special hole in the middle, and you’ll be set for a long, lazy day in the sun. A handy little pouch tucked away behind the Fatboy logo will keep your keys and phone discreetly safe and close at hand. And when it’s time to head for home (or if you don’t like sand everywhere , simply brush off the sand with the Picnic Lounge’s special little brush and roll up the rug to make a bag. Although the rug is a whopping 2.10 x 2.80 metres, transport is no problem at all with the nifty carrying strap. 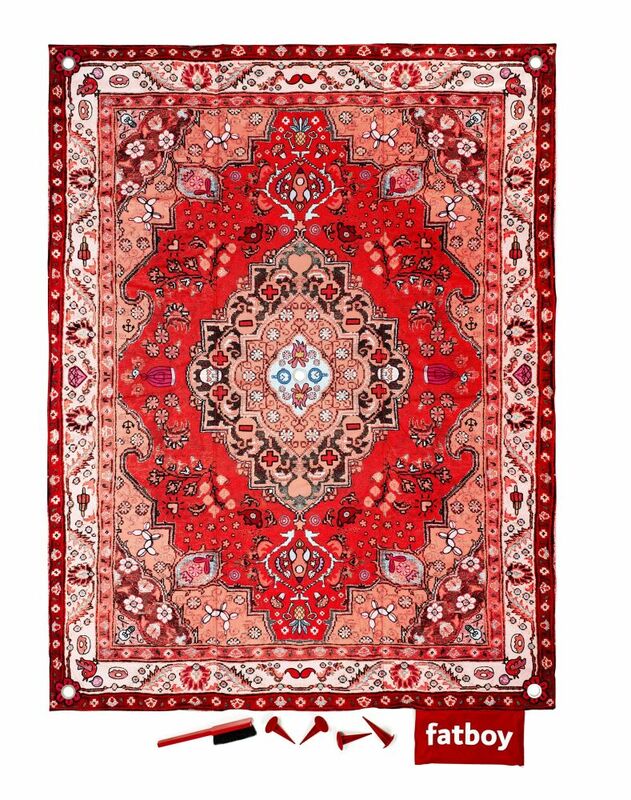 While its Persian pattern may have the appearance of a traditional rug, further exploration will reveal some surprising secrets.